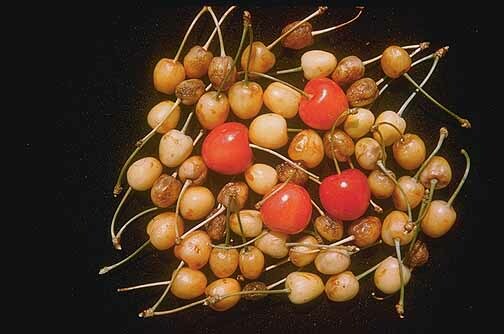 It is common to have what look like ripe cherries among unripe cherries with X-disease. All have poor flavor and brix development. These cherries were positive for phytoplasma. This disease is also called albino. Note the 4 healthy 'Royal Ann' cherries among the infected fruit. OSU Extension Plant Pathology Slide Collection, 1949. Cause A phytoplasma sometimes called cherry buckskin in California or albino in Oregon. Candidatus Phytoplasma pruni is the suggested scientific name for the Western X disease phytoplasma. X-Disease can be transmitted by budding or grafting, but because the disease is unevenly distributed in the tree, a fair number of buds will not carry the organism. Bud wood held in storage frequently will not transmit the disease. Leafhoppers spread the organisms in the orchard; Colladonus geminatus and C. reductus are the most common vectors. Leafhoppers positive for the X phytoplasma are most active in the spring and late summer into fall. Attempts to control the disease's spread with insecticides for leafhopper control have been unsuccessful. X-Disease has not been reported in the Willamette Valley of Oregon but was widespread in Wasco county and found in Umatilla and Malheur counties. The disease has been found in several eastern Washington locations and has increased in incidence in the 2010's. Several Prunus species are hosts including peach, plum, bitter cherry, and choke cherry. Tumble mustards, flixweed, and puncture vine have also tested positive for X-disease phytoplasma. Symptoms Fruits are small, pointed, often flat-sided, and pale-red to greenish-white. Normal appearing fruit may be interspersed with affected fruit. Fruit lack maturity, flavor and/or sugar development. Affected fruit often is confined to a small portion of the tree; the rest of the tree bears normal fruit. Leaves on terminals are slightly rosetted and become bronze or rusty several weeks earlier than healthy trees. A late growth flush may develop from normally dormant buds. 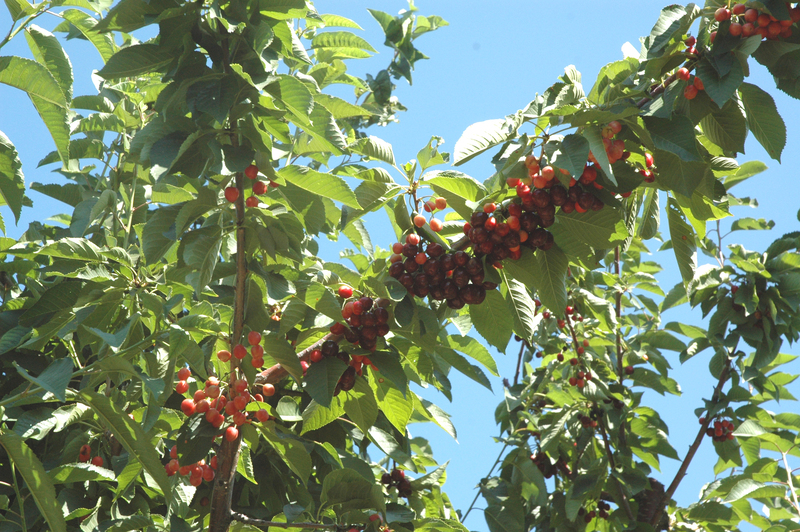 In sour cherries, older infected twigs and branches may have considerable dieback. The albino strain is not known to go to peaches. Cherry on Mahaleb rootstock develops pits and groves between the scion and rootstock, forming a dark line under the bark. 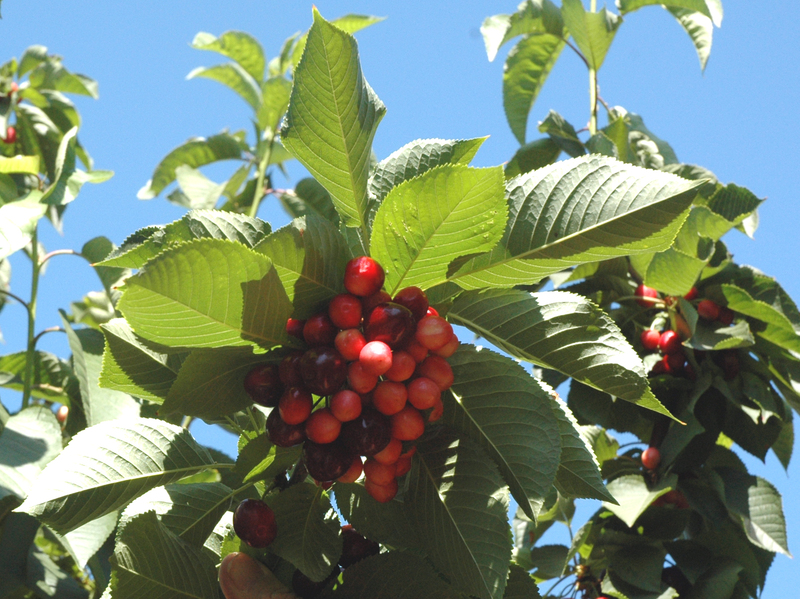 Trees infected with Little cherry virus will also have symptoms of little, off-colored poor tasting cherries. When X-Disease first appears, spray trees thoroughly to kill the vectors, and then remove infected trees. However, if many trees are infected, this may not be economically advisable because infected trees still can produce fruit that looks healthy. Trees on Mahaleb are very susceptible and usually die within a few years. Trees on Mazzard show symptoms for many years but seldom die. Remove wild chokecherry (Prunus demissa) or other hosts that can be a reservoir of the pathogen in the vicinity.